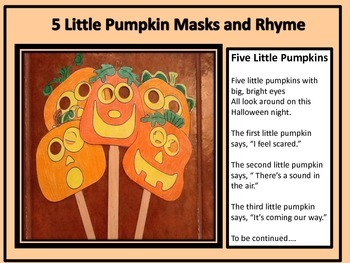 Your children will love making these masks and wearing them to act out the Five Little Pumpkins Rhyme. The pattern comes in color or in black and white outline. Just print on cardstock, color and cut. Cut out eyes at dark center circles. Use a tongue depressor to hold the mask. This is great to use for a drama activity. All look around on this Halloween night.